One of the main reasons we don’t get what we want out of life is that we often don’t know what we want. We may be very clear on what we don’t want, but we forget to articulate what it is that we do want. I’ve learned over the years that we get more of what we focus on. If we look at the good in our lives, we seem to get more good. If we focus on what’s not working and what’s broken, we get more of that. Research has proven that our brain gets accustomed to seeing the types of things that we usually look for, and then that’s all that we can see. When we stay focused on what we don’t want, we get more of what we don’t want. It’s when we can move ourselves to verbalize, imagine, and stay stuck to what our true desires are that we bring them to us. I heard recently about “negative target fixation.” This is a term that is used in the aviation field. It is used to describe the nearly 90% of crashes experienced by small airplanes. Apparently, when a small plane needs to make a sudden landing, it is often in a large, open field, with very few trees. As the pilots bring down their planes, they say over and over to themselves, “Don’t hit the tree. Don’t hit the tree. Don’t hit the tree.” Invariably they hit the tree. They would have been much more likely to land in the field if they kept repeating, “Land in the field. Land in the field. Land in the field.” If they focused on what they desired rather than on what they did not want. Perhaps it is fear that keeps us from declaring our desires – fear of the unknown, fear of putting a stake in the ground and declaring what we want and then not getting it, or fear of actually getting our heart’s desire. The surest and fastest way to getting what we want out of life is to spend the time to determine what we really want, and then hold that in our focus and our sights. What do you want out of life? What’s holding you back from going for it? Take time each day to determine what you want from that day, and from life overall. When you feel yourself pulled back to what you don’t want, or what you already have, bring your focus back to your goals and dreams. 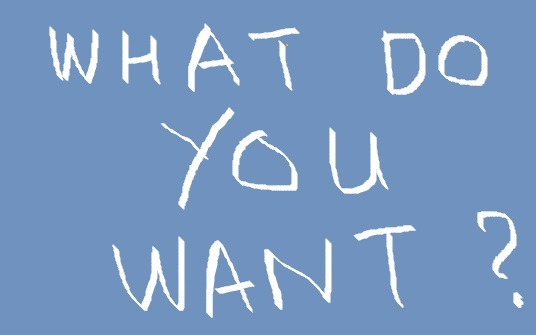 What questions do you have about knowing and focusing on your wants? If you want to determine what you really want, contact Lisa at lkohn@chatsworthconsulting.com.